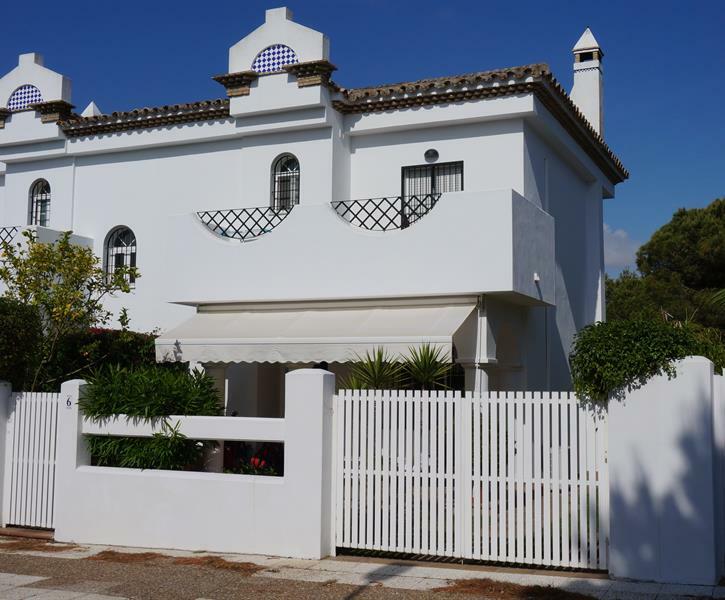 Luxury 3 bedroom, 2 bathroom villa only 10 min walk from wonderful La Barrosa beach and local facilities. Close to great golf. Downstairs - Living / Dining Room 2 sofas, sideboard, dining table, 6 chairs, 20MB Wi-fi, SMART TV (including NETFLIX & Youtube apps) UK Sky satellite TV / DVD / Hi-fi, wood burner, fan, air conditioning, electric heater. - Kitchen - Fully fitted: fridge/freezer / washing machine / oven / ceramic hob / microwave / coffee machine / toaster - Cloakroom - toilet / washhand basin / shower Upstairs - Main bedroom with double bed / large fitted wardrobe /air conditioning - balcony with table and chairs - 2 further twin bedrooms (both air conditioned with views over private park). Travel cot / fans/ electric heaters - Modern bathroom with walk-in shower, heated towel rail - Misc. Hairdryer / ironing board & iron Outside - enclosed garden (safe for young children) - 2 patios (front and rear) - BBQ Facilities - beach (500m) - tennis (local club 100m) - golf (5 min drive to Ballesteros course at Novo Sancti Petri) - horse riding - surfing (malibu / kite/ wind / boogeyboard) - bars / restaurants / shopping close-by Places to visit - Cadiz / Jerez / Seville / Gibraltar/ White villages How to get there (driving times from destination airport in brackets) - Fly to Jerez (45min) / Seville (90 min) / Gibraltar (90 min) / Malaga (3 hrs) / Faro (3 hrs) - Note that car hire is recommended to make the most of the local attractions. The photos of this property do not do it justice. Immaculately clean and well presented. Everything provided to create a home to home environment. Nice residential area about 15 mins walk from sandy beach. This is a modern 3 bedroom house with all the facilities you would need to live comfortably. The bed in the master bedroom was very comfy and the area was so quiet that sleeping was not an issue. The bathrooms were well equipped with great showers. As we had very stormy weather we lit fires most evenings which gave a very cheery atmosphere. Internet worked well which is sometimes not the case in Spain. It was less than 10 minutes walk to the beach which was stunning (if you like beaches).